Anime fans know the secret ingredient to making characters look really cool: a scene where their hair is blowing effortlessly in the wind. (That’s like Anime Aesthetic 101.) Let’s take a break from regular lists and take a look at some moments we know will have some windy-hair action. An anime OP song isn’t complete without at least ONE character posing dramatically with their hair carried into a soaring breeze. Sora and Shiro in No Game, No Life’s opening theme, have nailed the “anime hair blowing in the wind” coolness. Sakamoto looks longingly at the school in the show’s final episode. The wind gently tosses his hair, sending his silent whispers back to his classmates. What is he thinking? Will we ever know? Why is Sakamoto’s simple anime hair so much the cool-cooler-coolest? Here are three windswept-hair introductions for the price of one anime gif. Things really are more magical in the Special Region in GATE. Especially in other worlds, anime girls are just so much more dramatically introduced when their hair is blowing. Chiyo is experiencing a life-changing chance encounter in Monthly Girls’ Nozaki-kun. The set up is perfect… it’s too bad that this is the last moment of romantic perfection she’ll ever have. Let’s enjoy this moment of windswept peace with its side of doki-doki. When you see both main characters of a shoujo anime speaking alone about their feelings, cue the wind. Misa and Usui from Maid-sama!, as well most of their shoujo peers, share a private heart-to-heart on the roof, and it wouldn’t have been nearly as dramatic without the romance-filled gusts! Anime is a master of figurative storytelling and posing, and there’s nothing like dramatic windstreams to bring the message home. Case and point: Hinata and Kageyama from Haikyu! are imposing in this stylized vision. Here’s your harbinger of Halloween season! This moment of foreshadowing on the roof is punctuated by Mei’s hair being blown by a foreboding wind. It’s just the kind of scene that prepares you for all the bad things that are about to happen. The Fall season means different things to different people. Whether you’re into autumn because of the cooler weather, new Fall anime, or the impending arrival of Halloween, there’s something for everyone this season. In our case, we used the coming fall to celebrate one of our favorite aesthetic anime tropes. 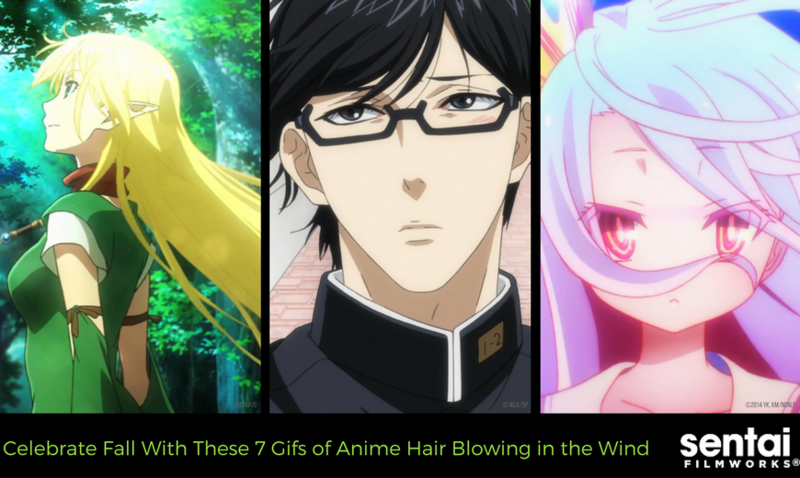 Which of your anime faves looks the coolest with their hair blowing in the wind? Let us know on Facebook, Twitter, Tumblr, and Google+.